Catering and general purpose degreaser. Emulsifies animal fats, grease, oil, blood and protein with ease. Non tainting. Suitable for use on aluminium. Eco-friendly low foam formulation. Suitable for floors, walls, drains, gullies, and canopies in Kitchens, Bakeries, Restaurants, Hospitals and the Meat processing & Food Manufacturing Industry. Suitable for use in scrubber drier machines. Scrubber driers: Dilute product with 80 parts water. Regular damp mopping: Dilute product with 50 parts warm water. 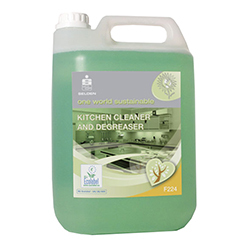 Regular cleaning by hand: Dilute product with 50 parts warm water. Heavy duty degreasing: Dilute product with 20 parts hot water. Deep fat fryers: soak in a hot (not boiling) solution with 20 parts water for 10-15 minutes. Proper dosage saves costs and minimises environmental impacts. Composition A concentrated blend of blend of builders and surfactants.